The Grande Albergo Quattro Stagioni is located inside a nineteenth-century building, situated in the historical center of Rieti between the City-hall square and that of the Prefecture, and next to the Romanic Cathedral of Saint Mary. Our guests will be welcomed with an aperitif served in an elegant environment embellished with period furniture, fine draperies and Murano glass chandeliers. On ground floor, the spacious and elegant lounge which gets its name “Giardino d’Inverno” (Winter Garden) from the coloured prisms of the glazed ceiling, is the ideal venue for cocktails, receptions, banquets and whatever else can meet your requirements or stimulate your immagination. This exclusive hotel offers all comforts combined with the highest standard of service. The Reception staff, multi-lingual, motivated and highly professional will be at guests disposal for the whole stay and any request will be handled with efficiency and a friendly smile. 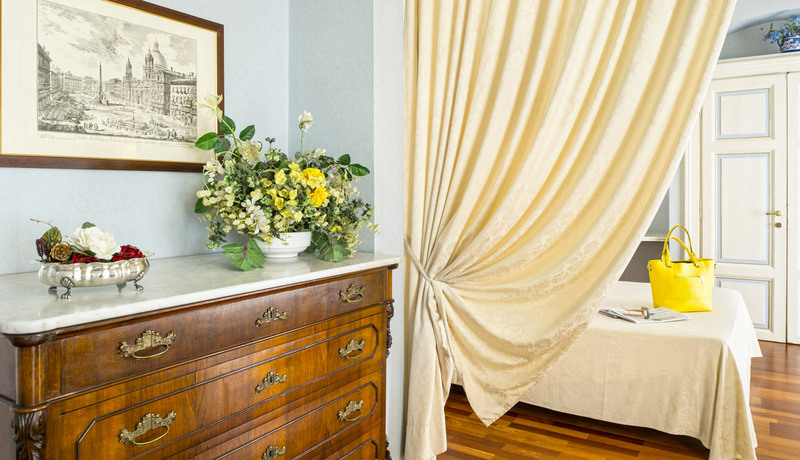 The hotel has 43 rooms, most of which providing views over the splendid gardens of the Prefecture with its historical Vignola Loggia, and other rooms overlooking the City-hall building and square with the famous Dolphin Fountain. They combine comfort and charm with the latest technology. Breakfast: the hotel breakfast offers an extensive variety of items comprising eggs, bacon, ham, cheeses, brioches, home made cakes, cereals and many more products. The helpful and efficient staff will be happy to prepare for you good espresso and cappuccini. Famous for offering the feeling of “home away from home” to its guests, it provides maximum attention to details in order to make its guests stay a most pleasant one.